In the two years that have passed since the Ethereum Blockchain’s genesis block, numerous decentralized applications (dApps) have created Ethereum smart contracts for peer-to-peer exchange. With hundreds of tokens and services on the Blockchain, the need for an open protocol to enable liquid exchange is as critical as Internet vendors accepting credit cards. 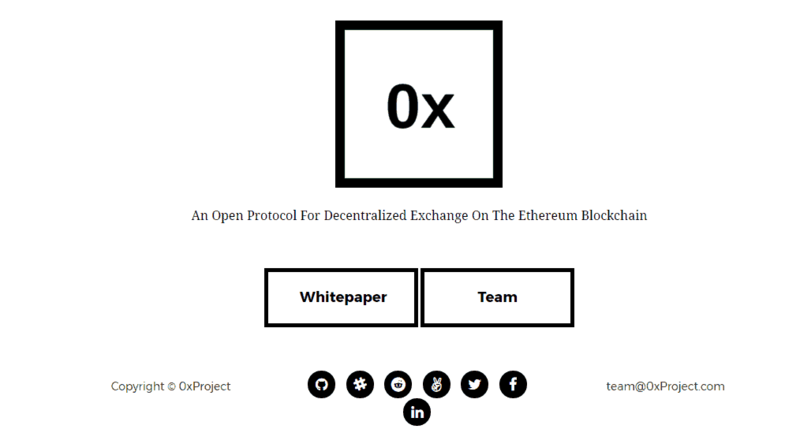 0x will facilitate a healthy and interoperable marketplace with trustless, low friction exchange of Ethereum-based assets. Today, rapid iteration and a lack of best practices have left the Blockchain scattered with proprietary and application-specific implementations. As a result, end users are exposed to numerous smart contracts of varying quality and security, with unique configuration processes and learning curves, all of which implement the same functionality. This approach imposes unnecessary costs on the network by fragmenting end users according to the particular dApp each user happens to be using, destroying valuable network effects around liquidity. 0x believes that smart contracts should act as modular, unopinionated building blocks that may be assembled and reconfigured. 0x is decentralized and trustless; there is no central party which can be hacked, run away with customer funds or be subjected to government regulations. Hacks of Mt. Gox, Shapeshift and Bitfinex have demonstrated that these types of systemic risks are palpable. 0x supports all Ethereum-based assets that adhere to the ERC20 token standard. Among 0x’s first partners to are Augur, MelonPort, Maker, and Aragon. 0x doesn’t just enable Interoperability between dApps, but makes the smart contract process easier and faster. Just as the growing API-economy enables the ability to order a Lyft from Facebook Messenger, a Melonport user could enter a prediction on Augur directly from the Melonport app. 0x is built on the belief that, by 2020, thousands of assets will be tokenized and moved onto the Ethereum Blockchain including traditional securities such as equities, bonds and derivatives, fiat currencies and scarce digital goods such as video game items. With hundreds or thousands of tokens on Ethereum, the 0x protocol also addresses the burden around dApp developers holding many tokens through a process called “token abstraction.” Token abstraction on 0x allows dApps to obfuscate smart contract interactions with application-specific tokens so that end users appear to only be paying transaction fees denominated in ETH (or even local fiat currency, assuming there are fiat-pegged tokens on the Ethereum Blockchain). Token abstraction works by chaining multiple orders together and executing them sequentially and synchronously in a single transaction. Along with Polychain Capital, Blockchain Capital, and Pantera Capital, Chinese investment firms Jen Advisors and FBG Capital also invested in 0x.